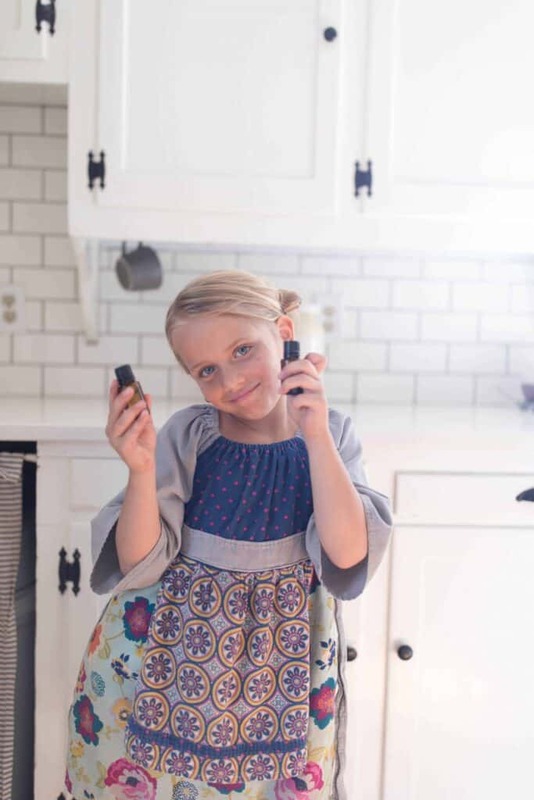 I invited my sister Laura over to the farmhouse to share her top three essential oil diffuser blends for kids. 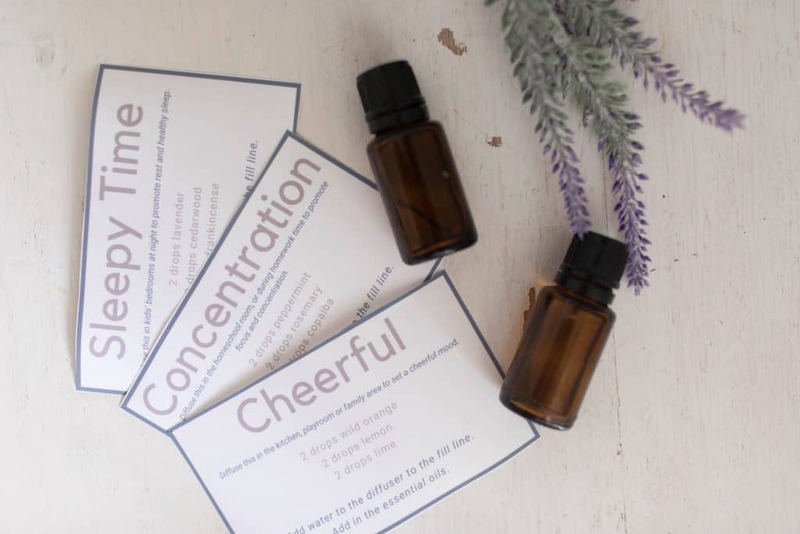 Diffusing oils can be helpful to promote cheerfulness, restful sleep and concentration. Make sure to scroll all the way to the end for the free printable recipe cards! You all know that I love using natural solutions in my home. Whether if be for cleaning, immune support or to sooth my kiddos when they have a bee sting, scrape or bug bite, I aim to keep the chemicals far away. All of my homemade products are potent because I add essential oils to them. Essential oils are the natural aromatic compounds from the leaves, roots, bark, flowers and stems of plants. They are SUPER concentrated. For example, one drop of peppermint oil is the equivalent of 28 cups of peppermint tea. This is why they are so effective. You’ve heard that peppermint tea can soothe an upset tummy, but I’m not about to make 28 cups of tea and ask my little ones to drink it. Instead I can put a couple drops into a roller bottle with a carrier oil and rub it right on the area of concern. In my kitchen a few drops of lemon essential oil goes a long way to cut the grease and grime from our farmhouse sink. I usually soak it and scrub it down once a week. Lavender on dryer balls makes the laundry flower-y fresh and all without filling our home with toxic fumes. My natural home would never be without them. 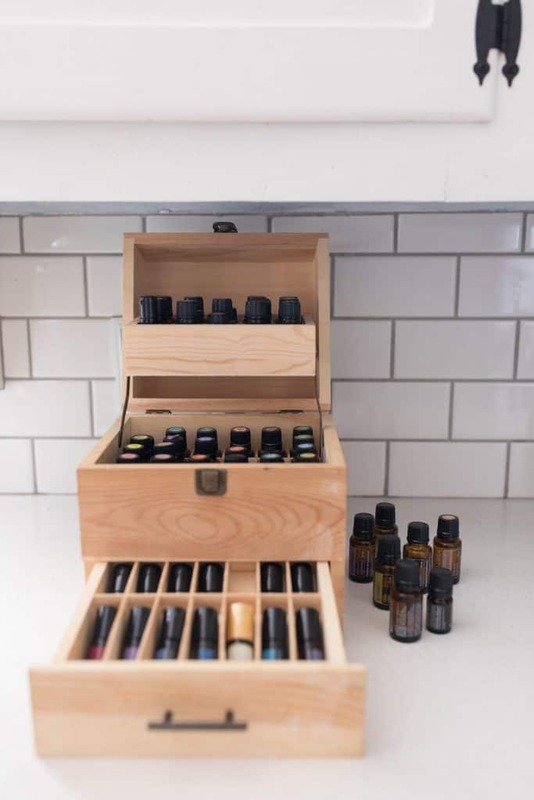 That’s why there is a big old box, overflowing with essential oils, out on my counter at all times. Sign up for our LIVE class HERE. 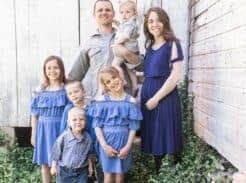 We are going to talk all about using essential oils with kids! Today we are going to be talking exclusively about aromatic use. 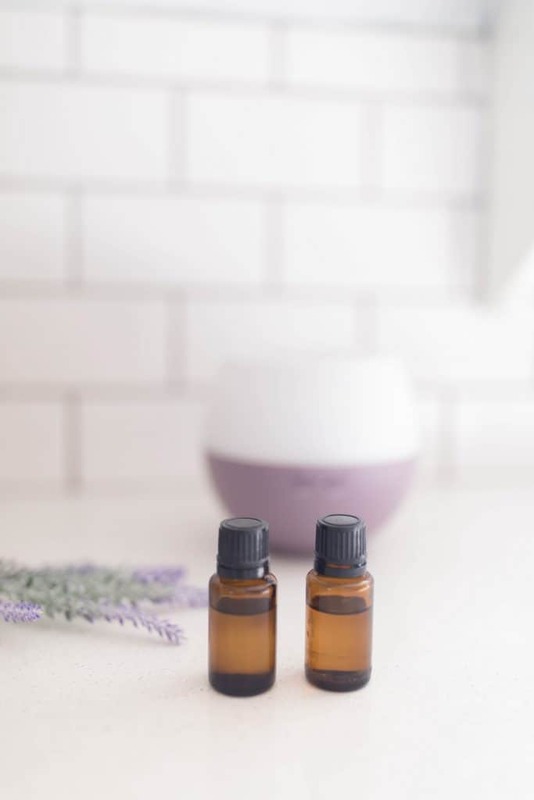 When you diffuse essential oils, they are broken down into tiny molecules and dispersed in the air. They enter the nasal cavity and go into the limbic system. 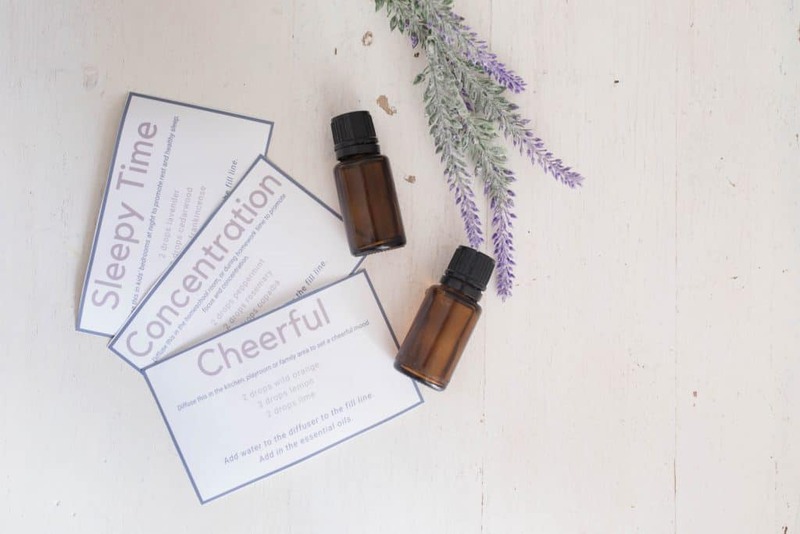 Since the limbic system is responsible for controlling the emotions and mood essential oils can promote a sense of well-being, cheerfulness, concentration and a healthy night’s sleep. 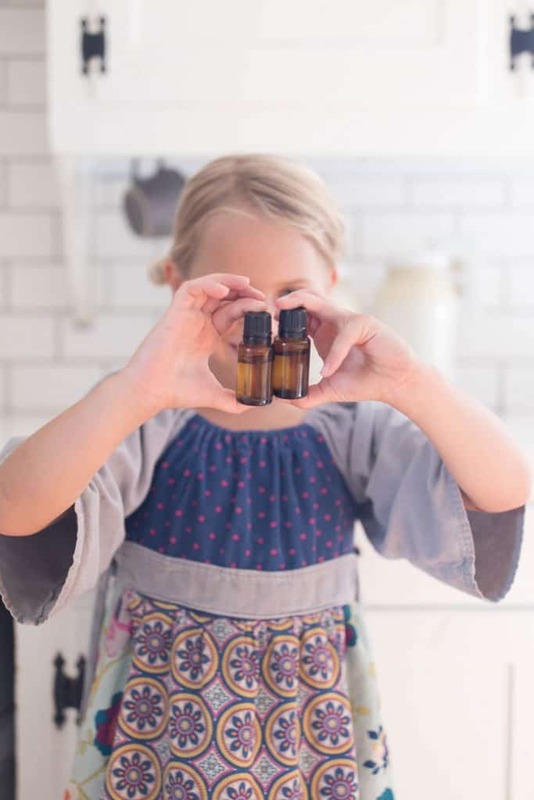 Laura and I both love using essential oils in our homes and around our kids. 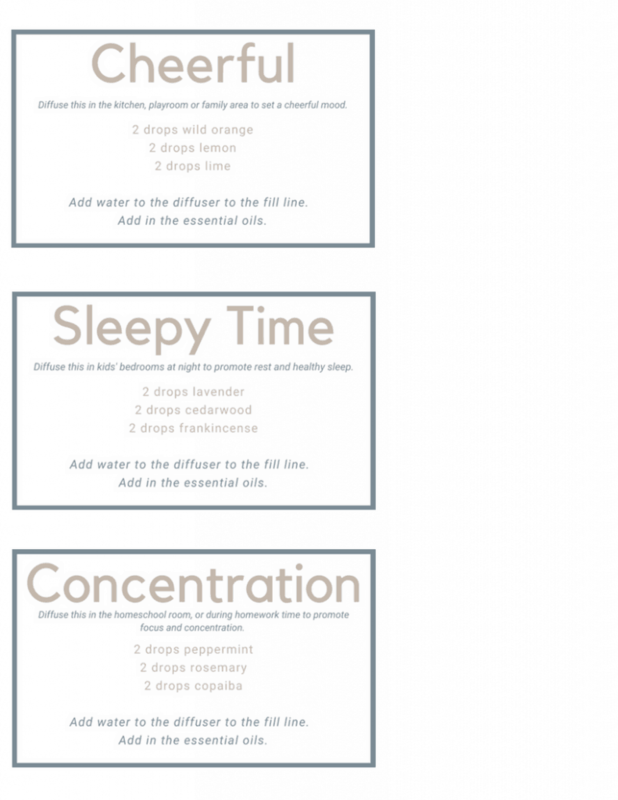 Today Laura is going to share with you her top three favorite essential oil diffuser blends for kids. Add water to the diffuser fill line. 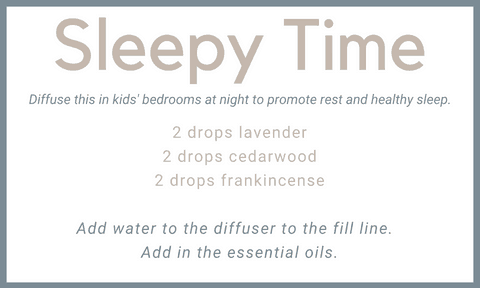 This blend is great to diffuse in your kids’ bedrooms at night, or during naptime, to promote healthy rest. Lavender is well known for its ability to calm the mind and promote relaxation. It also has been shown to reduce anxiety and depression. I find this article very interesting. It points to some specific studies that were done to find out if lavender truly does help sleep. Turns out its more than just hype! According to this source cedarwood “has sedative effects when inhaled”. No wonder it is so effective for nighttime relaxation and stress relief! Frankincense is also called “the king of all oils”. It has so many benefits for the body, but one is its ability to relax and calm the mind. It rounds out this blend to help kids get a good night of rest. 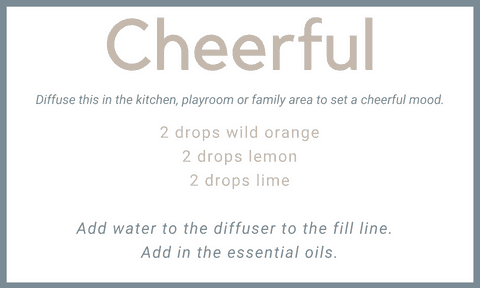 Citrus oils are effective at uplifting the mood. They have a bright cheery scent, and make the home smell amazing! We try to keep our kids outside a lot, because I truly believe thats where kids belong. They can use their imaginations, get dirty and be loud. But, some days, we have so much to do inside that they have to be in some too. Also, not to mention, the dreaded W word that is coming up in about 4 months. Things can get a little crazy when this small home of ours has five kids running around it all day. We need something going in the diffuser to keep the mood light on those long days where to only option is to stay inside. This cheerfulness blend, full of citrus essential oils is the perfect thing to brighten the day and keep everyone nice and cheerful! Do you homeschool your kids, or help them with their homework in the evening? If so, you probably have noticed that sometimes its hard for them to focus on the task at hand. 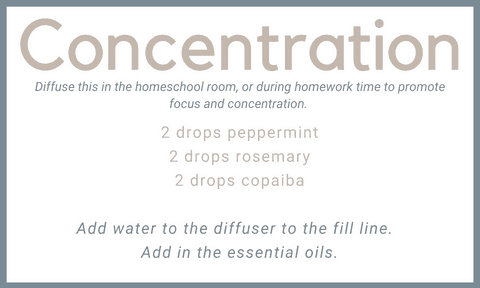 This concentration blend is excellent to diffuse to help them focus on their work and retain more to memory. Rosemary essential oil is known for its ability to strengthen memory and promote concentration. 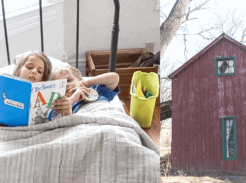 When diffused in the homeschool room, or during homework, it can help your kids to retain what they are reading and working on. There is this thing that’s going around Facebook that says “I got 99 problems, and copaiba solved 99 of them”. People are in love with the stuff. And for good reason. It is a powerful antioxidant. It helps calm, soothe and support the immune system. Its also excellent for the skin and helps reduce blemishes. Copaiba’s almost honey-like scent helps to alleviate anxiety and stress. How about you? What are some of your favorite blends to diffuse in your home, around the kiddos? Download HERE, or just click on the picture above. 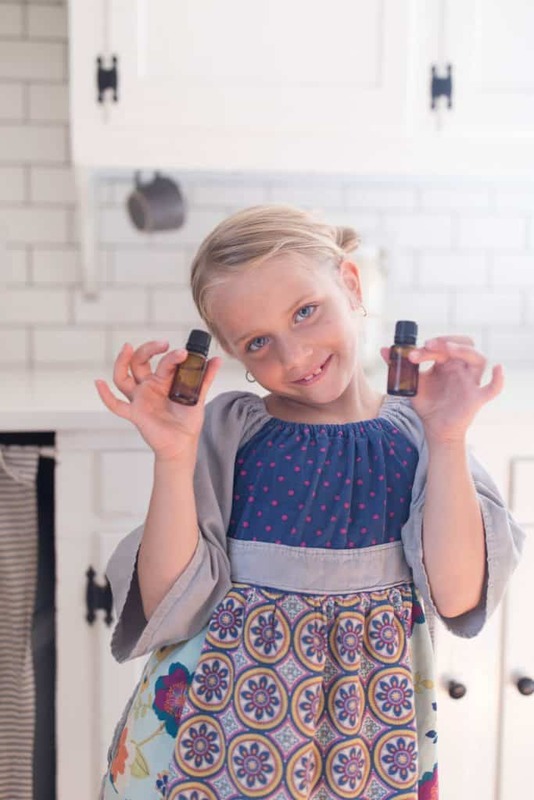 Where did you get that adorable dress the blond girl holding the oils is wearing? I love it!!!!!! Did you make it? Do you sell it? I have signed up for the live class you and your sister are hosting but i’m not sure i will be able to watch live due to time differences… will it be possible to see a re-run? and I just have to ask where you got that beautifu wooden chest for your oils?! Would you be able to make the kids blends in a roller? We don’t home school but I would love to have a roller combo to get her ready for her day. Thanks!